Who among us isn’t looking for good value? Everywhere you look marketing gurus sling “value” at consumers luring them in to the next big thing. Most quick-service restaurants offer value meals or value menus. But have you ever considered the value of the value-added programs that are available for your cattle post-weaning and through the feeding phase? Yes, the months of caring for your livestock and hours of labor you have invested in your calf-crop has already added value to them. But take that one step further by finding a value-added program to enroll them in and see added dollars in your pocket. “A value-added program differentiates commodity cattle from a higher-quality animal,” according to Clint Berry, Superior Livestock Auction representative based out of Missouri. There are a plethora of value-added programs, Berry adds, but cattleman should find the one(s) that best match their management and genetics to their own operation. Programs vary from documented vaccination protocols to supplementation/trace mineral nutrition programs. There are varying degrees of all-natural programs from signed producer affidavits to third party verified. Value-added programs can also include source and age-verified and/or Non-Hormone Treated Cattle (NHTC), which are designed to meet export qualifying requirements to specific countries. There are even programs to verify genetics defined by your source(s) of bulls and their EPD values. “With all value-added programs, buyers have the confidence that an unknown product offers less risk and/or greater potential returns to the buyer when they remarket or harvest those cattle,” Berry said. BioZyme® is now the exclusive nutrition company for Superior Livestock Auction’s value-added program. And while Berry said that Superior has offered numerous value-added programs over the past two decades, the basis of all value-added programs should begin with proper nutrition to best utilize animal health and genetics to their fullest. “BioZyme has built a strong reputation of delivering products that enhance our cattle’s ability to utilize forages while ensuring trace mineral requirements have been met for added production and longevity,” Berry added. 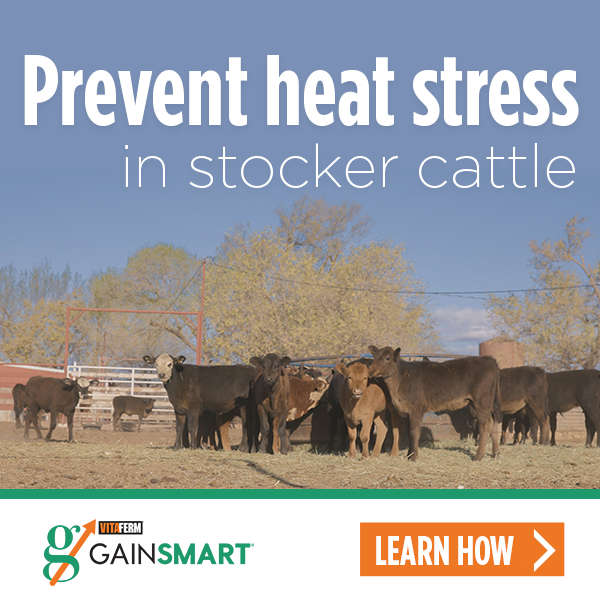 To qualify for the Gain Smart™ program, and to carry the onscreen logo on Superior, calves must have been backgrounded for a minimum of 45 days prior to sale through delivery on a Gain Smart mineral. VitaFerm® Raised calves must have been raised on a VitaFerm fed cow and/or fed a VitaFerm mineral themselves during pre-conditioning for a minimum of 45 days prior to sale through delivery. So what is the value to you for participating in a value-added program? Berry said that varies by program, the market and cattle offered. Under current market conditions, whenever cattlemen face tight profit/loss margins, we need to maximum the value of every input cost and opportunity to capture value when we market our cattle. For three decades, Superior Livestock Auction has delivered value-added programs with a proven track record of capturing value for sellers by building buyer confidence for the increased profitability of cattle enrolled in said programs. Now more than ever, cattlemen need to take advantage of value-added programs when marketing to capture their return on investment they’ve built within their herds.